Every year, when the end of October looms, it’s time for Spiel, the largest tabletop gaming exhibition in the world! It’s held in Essen, which is about a 90 minute drive from our home, and we have been attending on a single day for some years now. We prefer going on the first day (when everything (and everyone!) is still relatively fresh), but it wasn’t clear until late whether klik had to work on Thursday evening. But her lesson on Thursday was cancelled because everyone was out, because it’s the fall vacation here — so we could go on Thursday after all. We set out at 09:00, which would see us arrive at the fair about 30 minutes after opening. When we started going, quite a few years ago, we could always park close to the fairgrounds themselves. Later, it got busier and we had to park in a parking garage a bit of a walk away. We were aiming at that again this year, but everything was full as we arrived. And since every road towards the fair had been jam-packed with cars, it took us a long, long time to get to the off-site parking where we could park and grab a shuttlebus. Next year, we might leave earlier, and we’ll go to the offsite parking straight away — it’s conveniently just off the highway (for future reference: exit 26 of the A52), and the shuttle buses are quite frequent. So we were off to a bad/late start, but we had an excellent day anyway. We didn’t have enough time to look at everything (ain’t nobody got time for that!) but we managed to hit all the stands I had marked up as being interesting before we joined B&G for afternoon tea, so after that we just wandered the halls. Mainly halls 4, 5 and 6, because they’re not as crowded, and that’s where all the ‘odd’ stuff is: the first three halls are large hard-core boardgaming companies, but the halls with the larger numbers are the smaller publishers, RPG companies, cosplay accessories etcetera. It’s a bit more chaotic, but I find it more interesting. 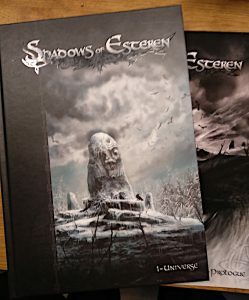 Spoiler Inside: Photos of (some of) the loot! 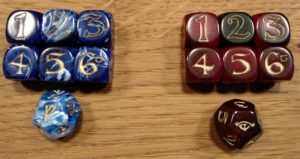 Did we need more dice? No, of course not. But we always want more! DnDice was selling crazy expensive metal dice (a EUR 400 platinum-coated set…), but they also had dice sets in very attractive colour combinations, housed in an attractive metal tin for easy storage and transport! They were very, very reasonably priced, so we got two. 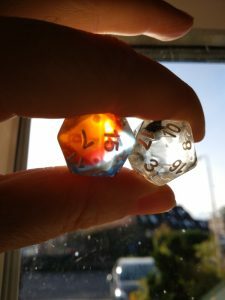 The D20s of both sets held against the sunlight. The left one has blue, clear and orange/yellow bands, the right one is clear with ‘smoky’ spots throughout. There were two new sets of dice out for The One Ring. The blue/white one is kind of hard to read, but it’s gorgeous. Red and gold are always a good combination, and with the imagery of the Eye of Sauron, it looks extra menacing! 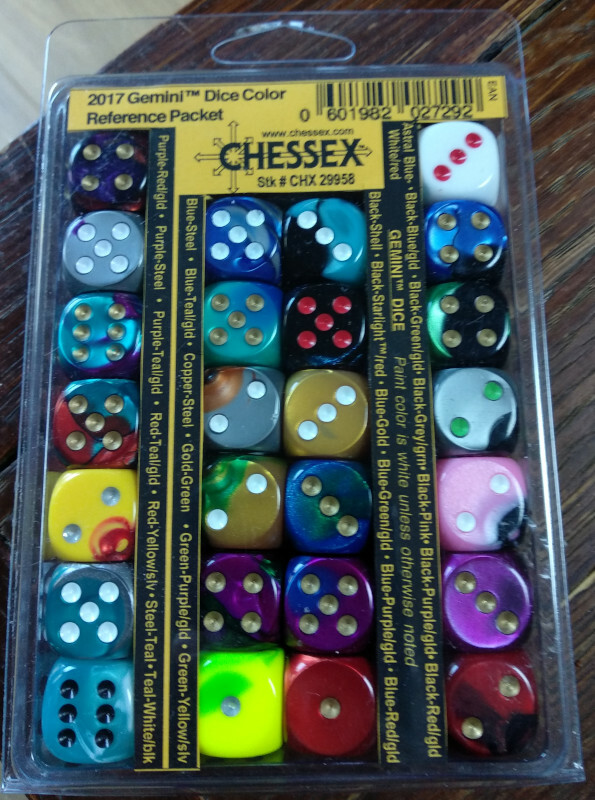 Just like with previous years, I bought one of Chessex’ reference packets. 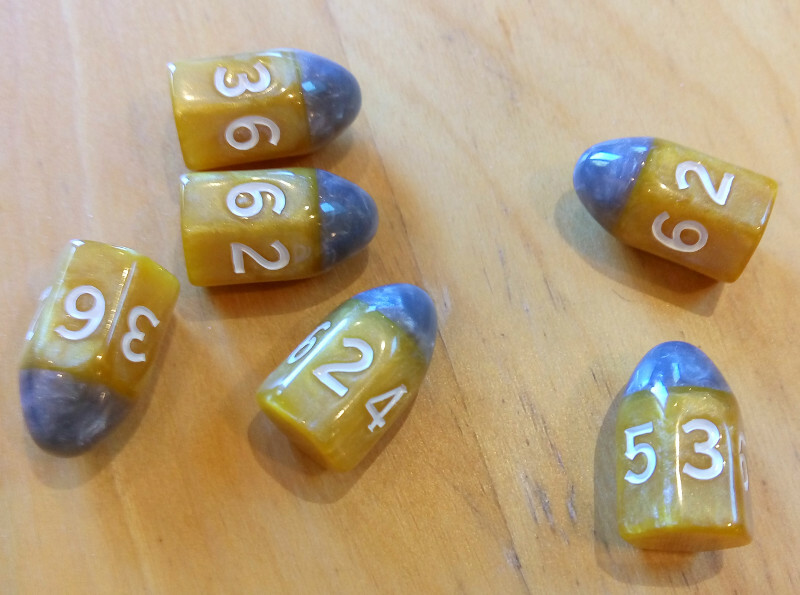 It’s an excellent way to get a large number of attractive dice. 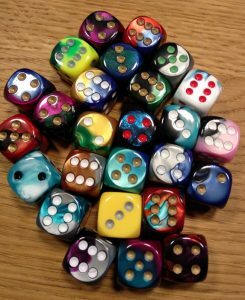 Personally, I prefer D6’es with numbers instead of pips, but the great colour combinations on all of these makes that I don’t care too much! I put this bunch in our ‘dice pot’, which is now completely filled. Not sure if we’re going to make a new one, or if I’ll just not get a reference packet next year. Publishing boardgames is quite capital-intensive, and for publishers who can’t (or won’t) float that capital (or take the risk!) there is of course Kickstarter. 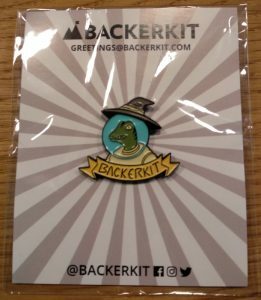 Backerkit is a website that allows backers to buy additional add-ons etcetera after a Kickstarter campaign concluded. They were at the fair with a stand, presumably to get into contact with prospective boardgame publishers. 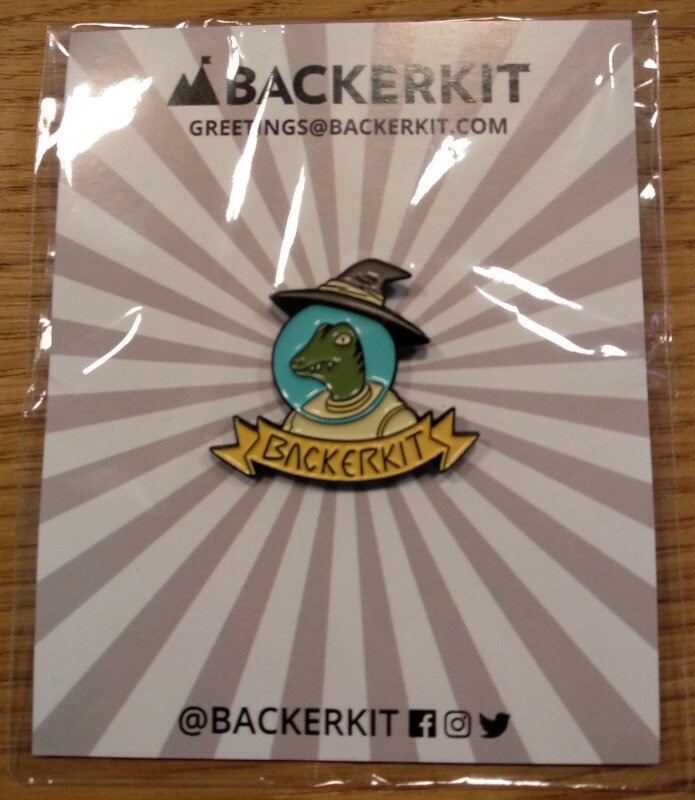 Obviously, I’m not their target audience, but if they offer up a free pin, I’m all about that! 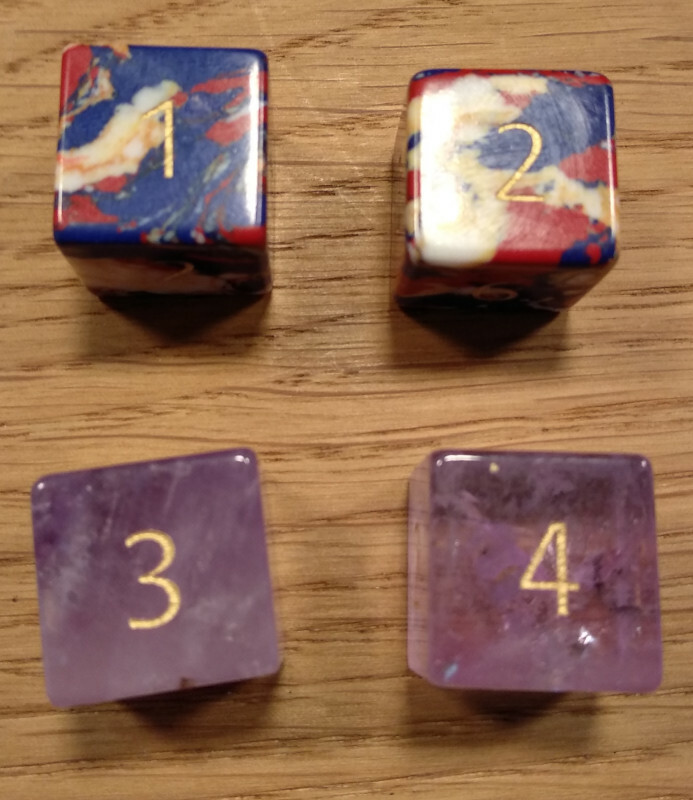 We got two pairs of gemstone dice from The Dice Shop Online. On top is a pair of fire turquoise dice, below is a pair of amethyst dice. The amethyst are especially nice, being semi-translucent. They catch the light beautifully. We came by the stand of the publisher of Shadows of Esteren, a dark-fantasy RPG. Normally, dark fantasy is not really my thing, but the books are really beautiful with great art and cartography. 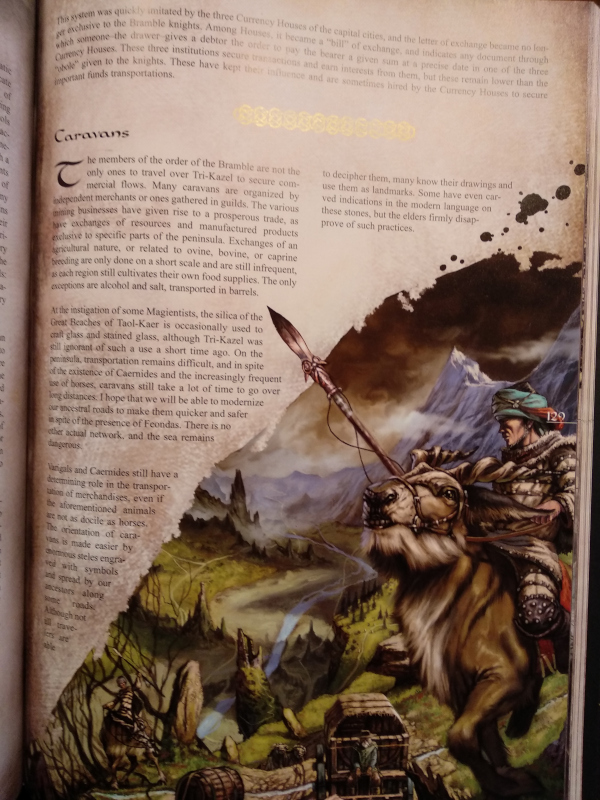 We got to talk with one of the writers (and stupidly enough I didn’t ask their name…) and they explained what their design goal was, how they went about it, what was in the different books etcetera. 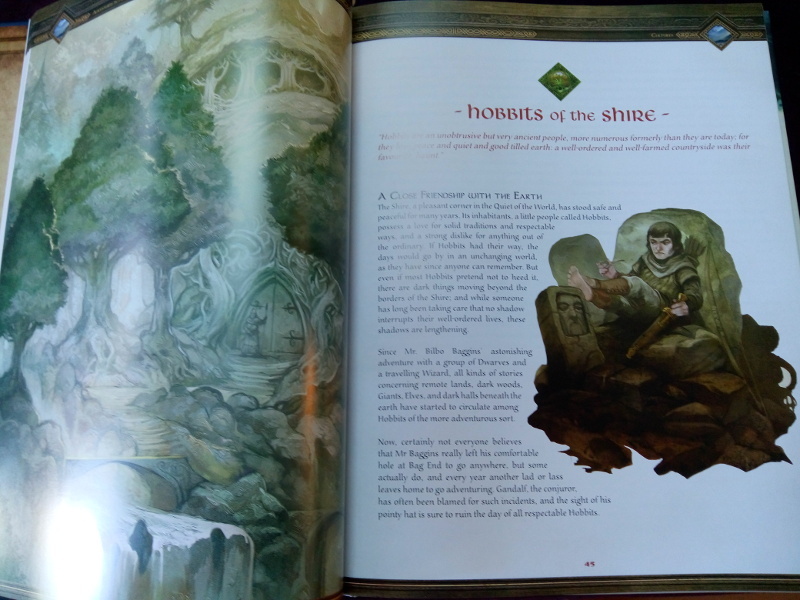 So I bought the main book and the ‘prologue’ (which contains three adventures), just for that and the beautiful books. 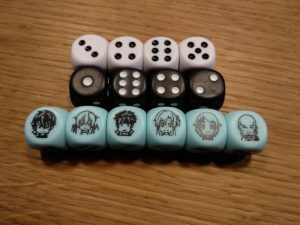 It comes with two sets of four ‘normal’ dice and a ‘character die’ for each of the six characters. Rolling their portrait allows for a ‘special move’. The reason we went by the stand of Japanimation Games is that they publish games based on Robotech — and then the Macross part of that series. My love for the Macross franchise is well-documented, so it didn’t really have to think long before I also bought Robotech: Ace Pilot, also fun little dice game that doesn’t really have many deep mechanics. I heard someone tell another visitor that a pallet of Attack on the SDF-1 had been delayed since it was fresh off the printers. They expected it in the next day — and it’s not even out in the US! So I was a bit bummed, but then I remembered that my friend was going on Friday, so I called him in the evening when we got back (at 20:00…) and gave him a few tips. He did manage to get the game for me, but don’t have it in my sweaty palms just yet. That’s just a matter of time, though. Last year, we had dinner at the fair, but when I walked up to the food truck serving up hamburgers, I was told that they were completely sold out! There were other options, but we decided to just go back home and get something to eat there. We arrived at 20:00, again eleven hours after we left! It’s always kind of exhausting: lots of walking, lots of simuli, but it’s always a lot of fun. We’re going next year, too. 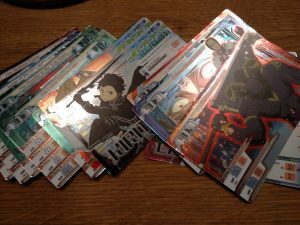 This year, we visited the Spiel international game exhibition at Essen again. On previous years, we went on Thursdays, which is the first day of the fair and the most quiet — and there might be some limited items here and there… But since klik had to work on Thursday evening, we decided to go on Friday. We got off to a late start (or at least, later than we had intended) and then messed up the navigation too, so it was around 11:00 when we got to the Messe. And by then, all parking spaces near the Messe had been marked as “full” — which meant we would have to park somewhere outside of the city and get a shuttle bus to the Messe. We had that one year, and it was an absolute disaster, so we were kinda bummed we would have to repeat that experience. But when we drove past the parking garage near the swimming pool (which is next to the Messe) we noticed cars going right towards it — and that line was moving. There were policemen standing on the corner, and they had a sign saying it was closed off with them — but they had not ‘deployed’ it. So if you followed the parking signs, you’d end up at the big parking outside the city — but we decided to try our luck anyway. And lo and behold: there was ample space in the garage, so we got to park reasonably close to the Messe! That was a huge relief, to be honest. Essen is more geared towards boardgaming — and we’re not huge boardgamers. But there’s some roleplaying games there, and I had marked the map with some stands that I was interested in. For some reason, Essen ends up being all about the dice for us. 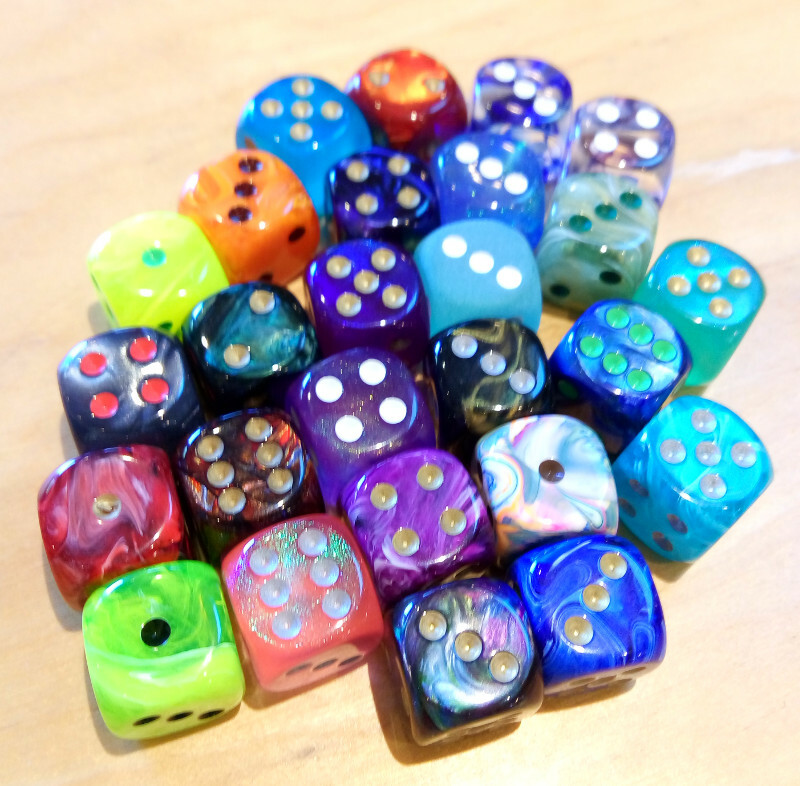 Because there’s no such thing as too many dice! 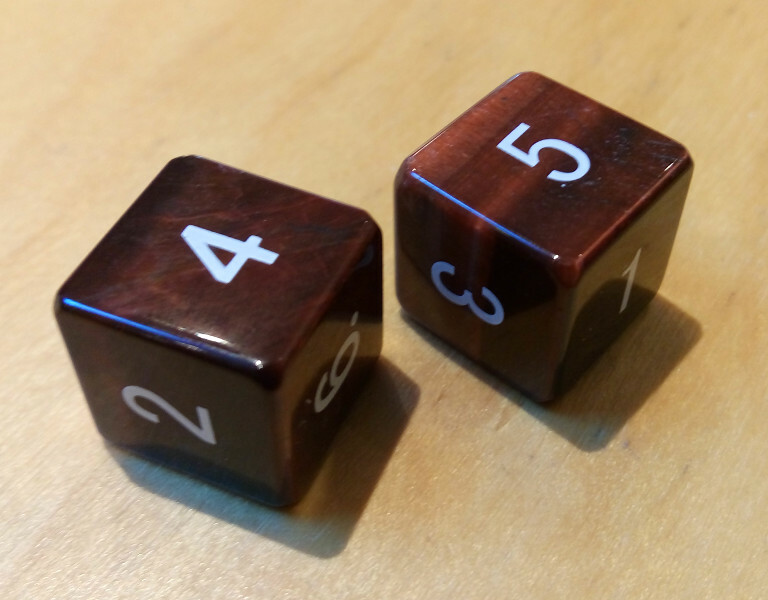 Q-Workshop has many, many speciality dice. One thing they’re pretty big in is themed sets for various games, which is fun. 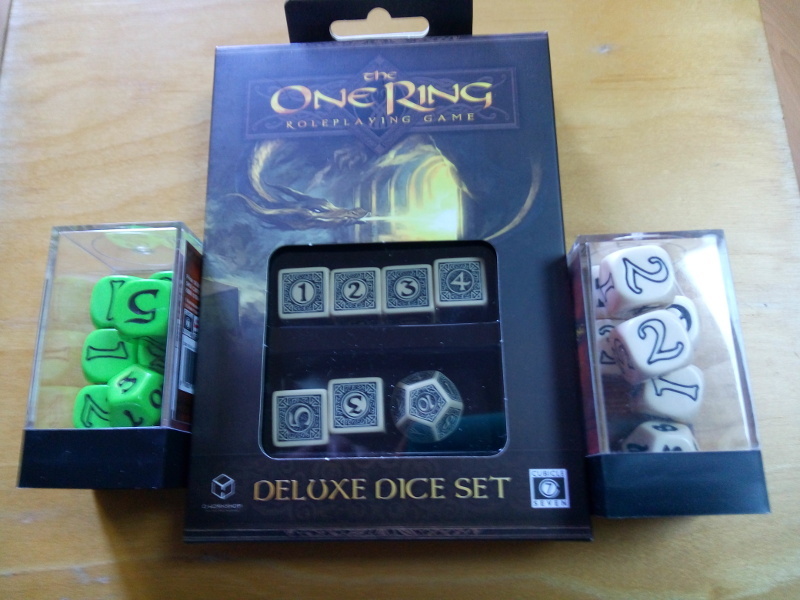 So when I learned that they had a deluxe set for The One Ring, it went on my shopping list. This is the set in the box, flanked with the sets I already had. Comparison of the two ‘original’ sets and the Q-Workshop set. It’s much more decorative, and I like that the edges and corners are not as ’rounded’ as with the other sets. 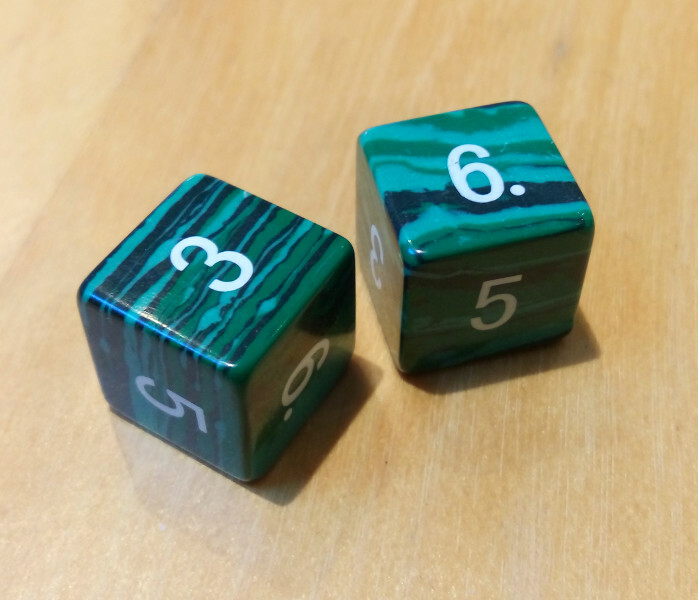 There is also an RPG of Dragon Age (which I have), and it uses a set of three dice, with one die in a different colour — the so-called Dragon Die. 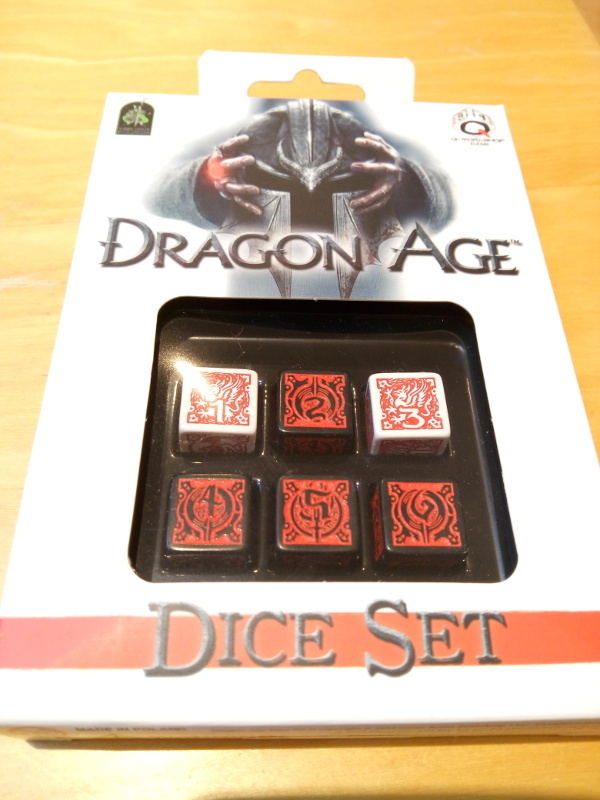 So I got the Dragon Age set as well. 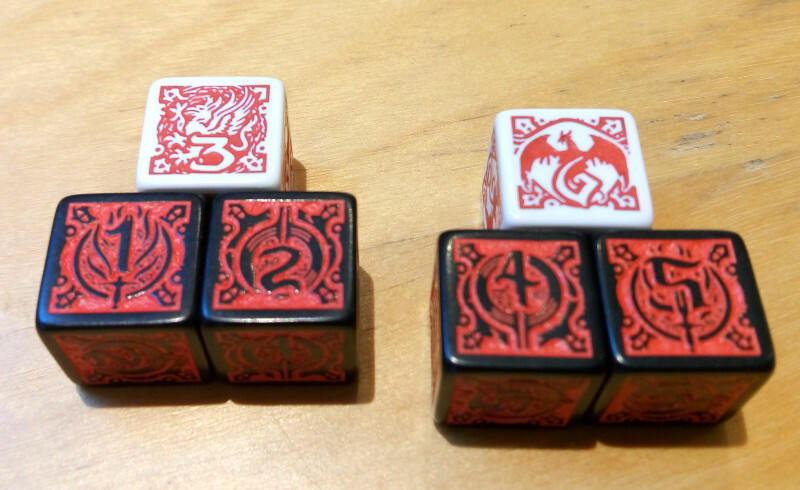 I especially like the fact that they have both a griffin and a dragon on the ‘dragon dice’. TheDiceShopOnline (nomen est omen) was represented with a large stand with their dice made of semi-precious stones on prominent display. 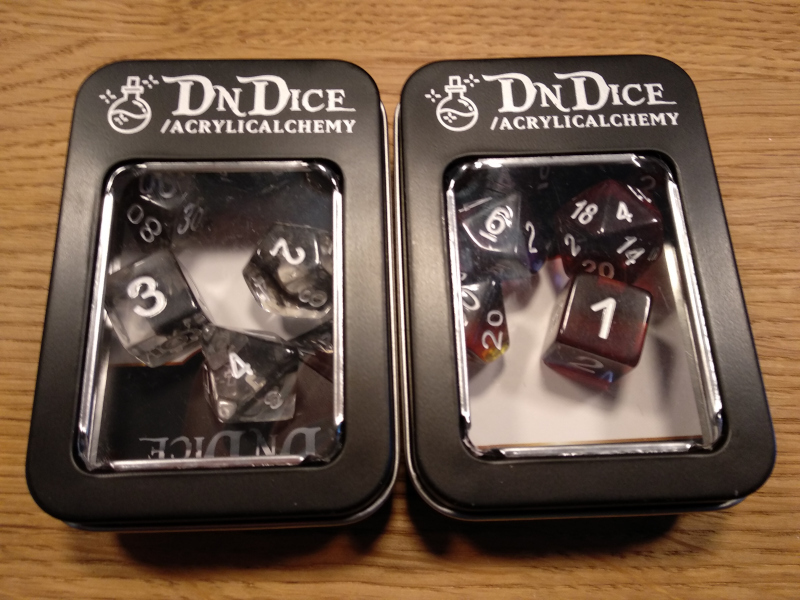 Good choice: I think they were the only shop with dice like that. 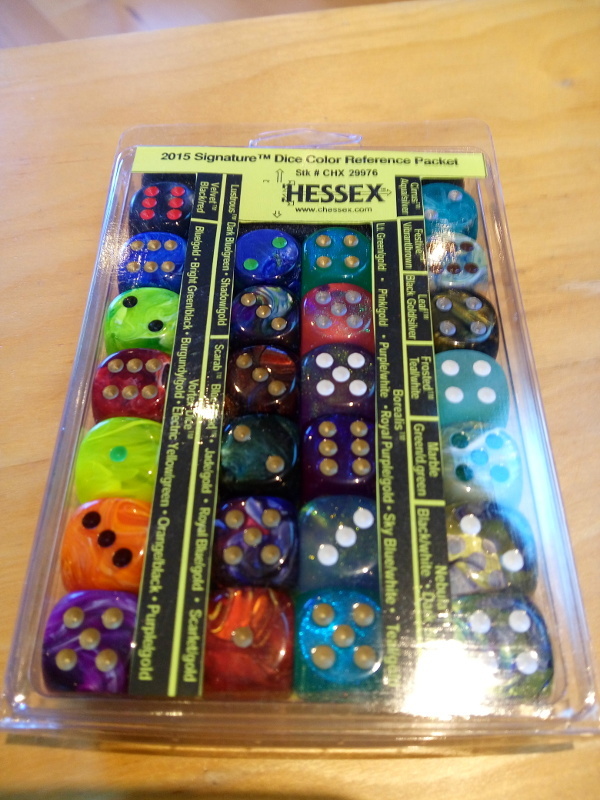 There were some really nice dice there, but we constrained ourselves to two sets of dual D6’es. They have a nice weight and feel cool to the touch. I chose a set made of synthetic turquoise styled like malachite. 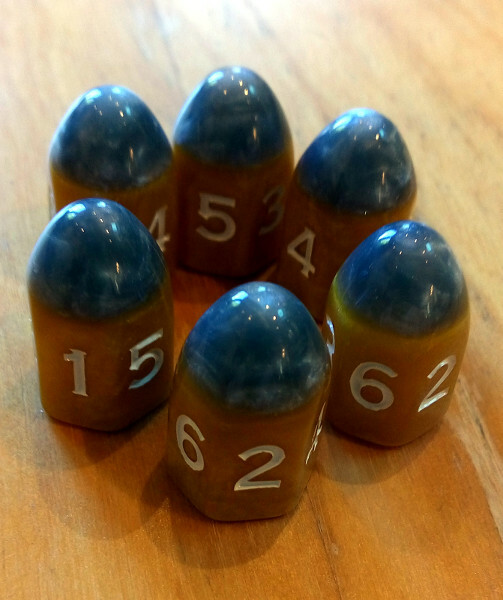 klik chose these dice made of brown Cats Eye, which were new and launched at Essen! This is the ‘warrior set’, a full set of polyhedrals themed after the weapons and armour of a warrior. There’s the D4 dagger, the D6 sword, the D8 mace, two D10 armoured fists (one marked with dots to set it as the ‘tens’ when rolling them to get a percentile), the D12 helmet and finally the D20 shield. They’re not really convenient or easy to read, but they’re kinda cool looking. 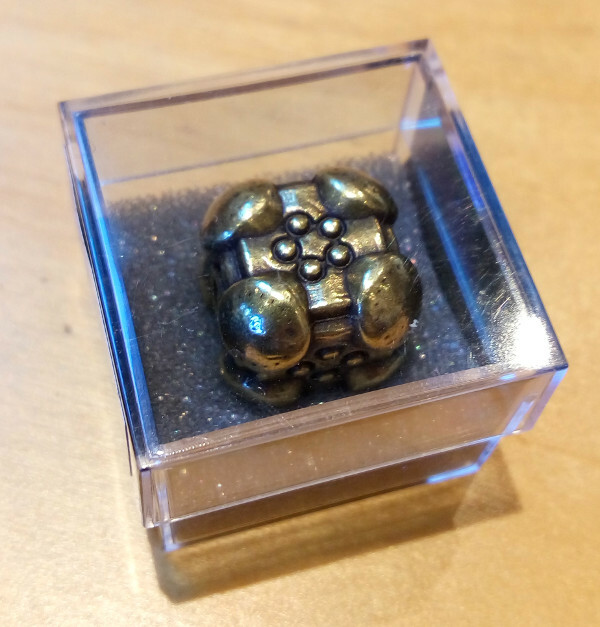 Bullet dice! Set of six, of course: that’s the number of bullets that go into a revolver. They’re fun to roll and easy to read. Pretty cool if you’re playing a western-themed game (which they were meant for — but they were also sold separately, so that’s what we got). 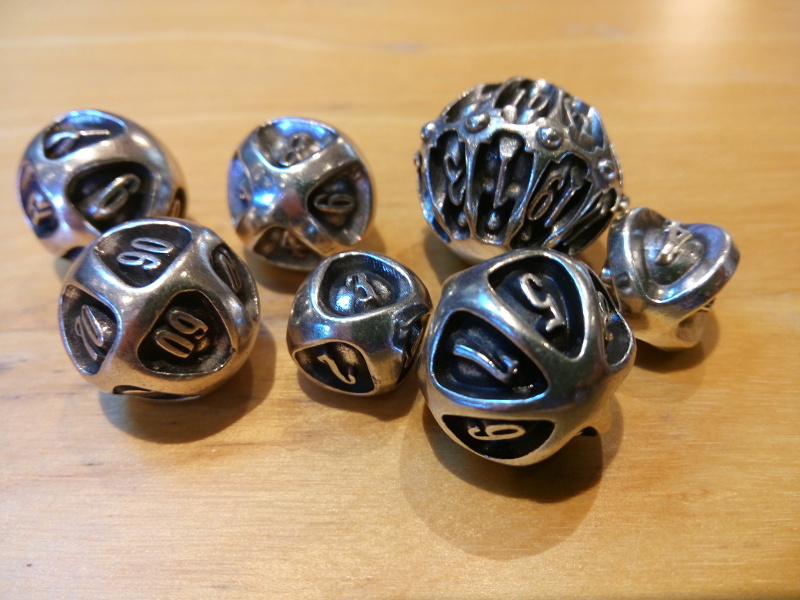 Irondrake is an Italian manfuacturer of metal dice, and their designs are really cool. Last year we bought one of their sets, and again this year there was a set that caught our attention. We also got to choose a ‘bonus die’ for free with the set! 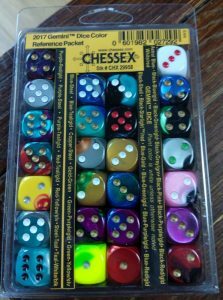 Chessex is one of the big manufacturers of specialist dice. They create some really nice sets (a few of which we gifted to first-time players). But there was nothing in their stand that really caught our eye — except for this packet. 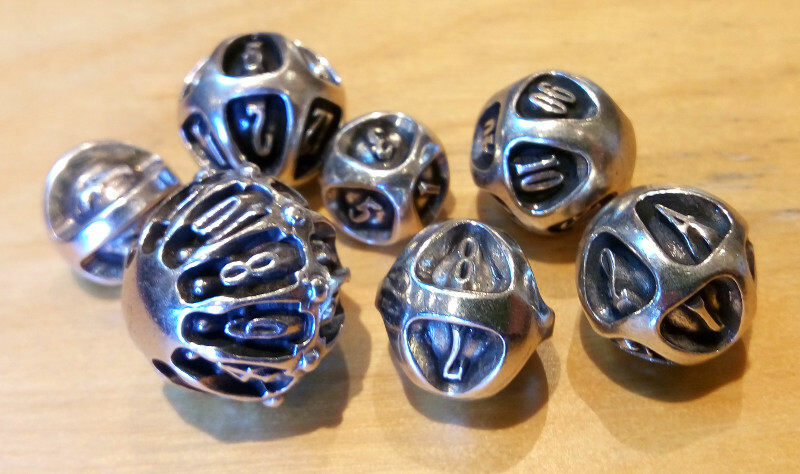 A large variety of the most beautiful dice — what’s not to like? 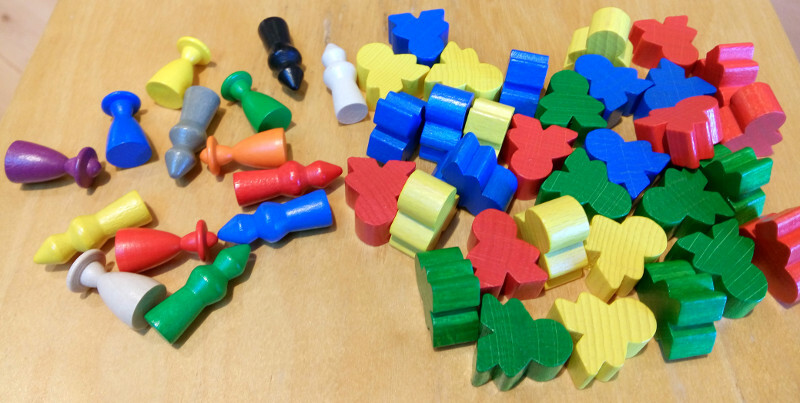 Wooden tokens/guys/meeples for use in roleplaying games: perfect to show relative positioning etcetera, without having to invest in miniatures (which I can’t paint worth a damn anyway). 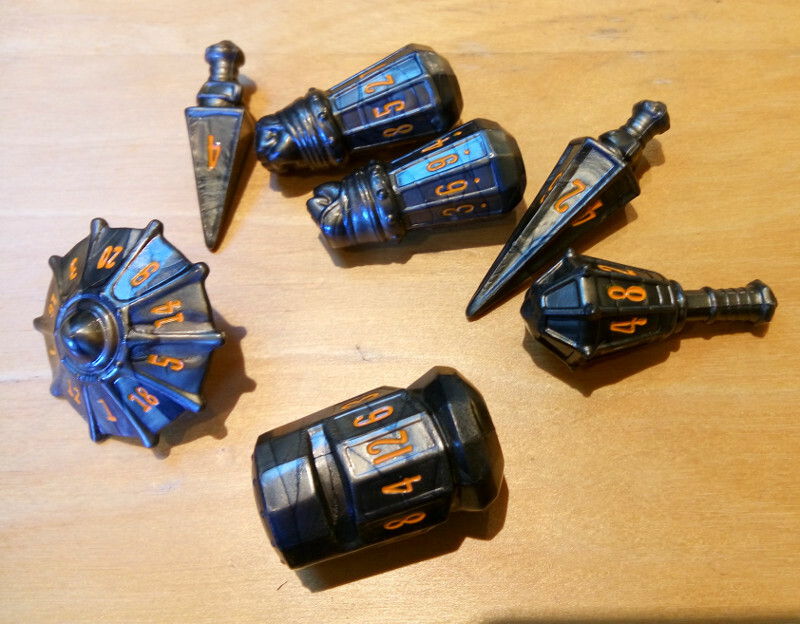 There’s a large shop that sells all sorts of these tokens and figures — some as replacements for components of existing games, some to make your own games with. 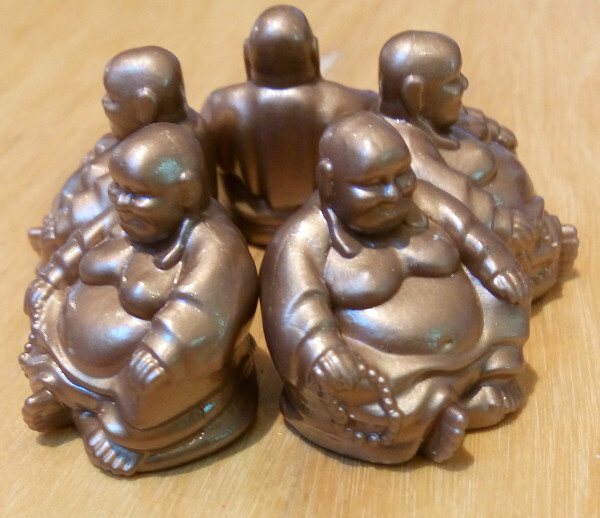 For some reason they also sold a packet of five plastic Buddha’s/Chinese lucky gods. We’re not sure what we’re going to do with them, but of course we couldn’t pass it up! 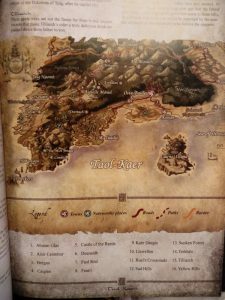 which ports the specific systems of The One Ring to the fifth edition of D&D. Kinda excited to read that. Finally it will be possible to actually play a Hobbit in D&D! As for actual games, we got three. 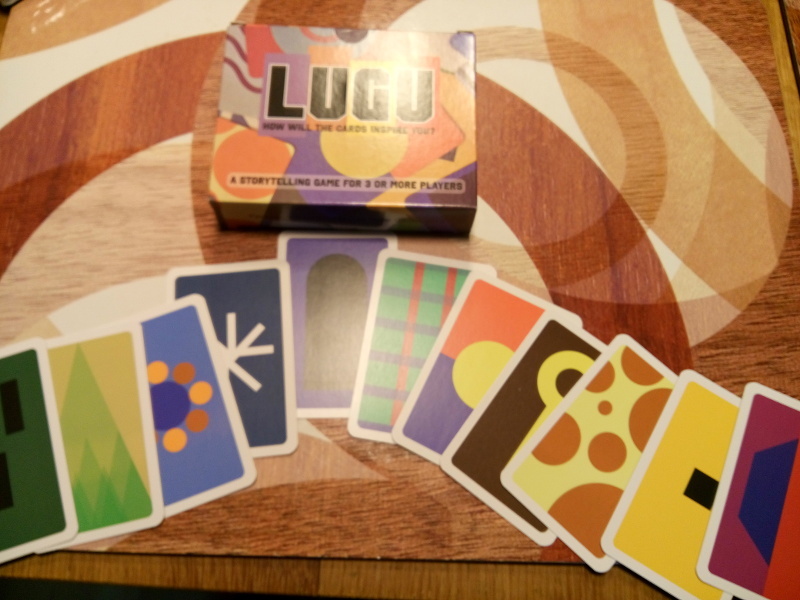 Lugu, a story-telling game based on abstract cards. 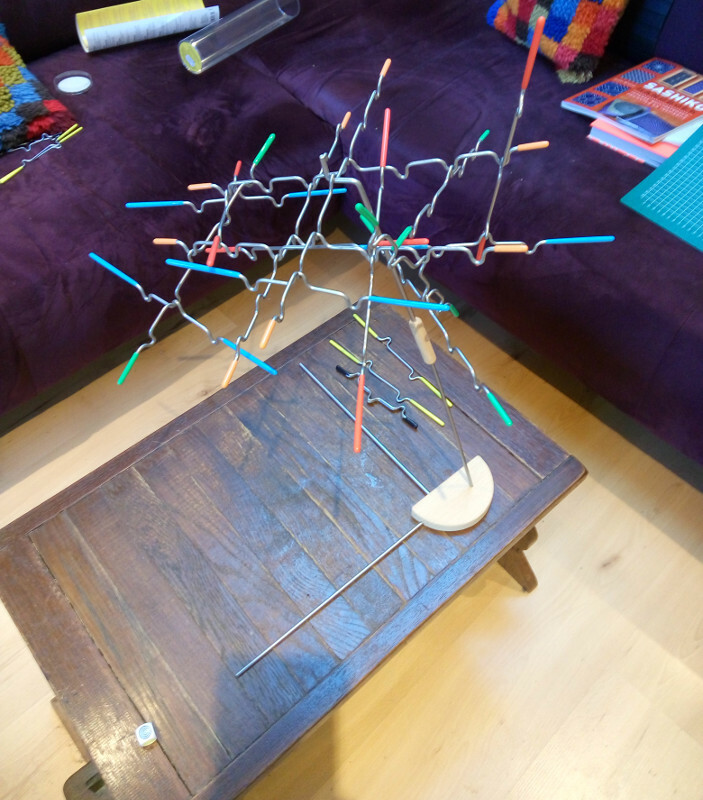 Suspend, some kind of gravity-challenged anti-mikado. Pretty fun! 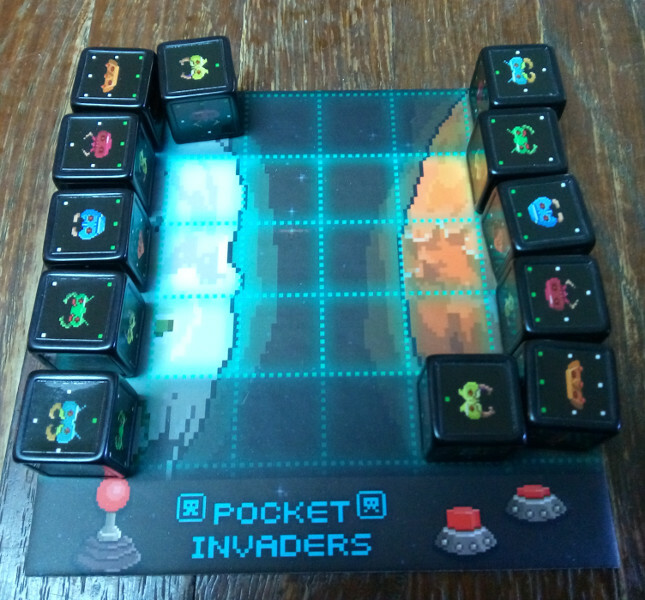 Pocket Invaders, a game with a pixelated retro-videogame feel. It’s a cool little game, which plays a bit like shoji. 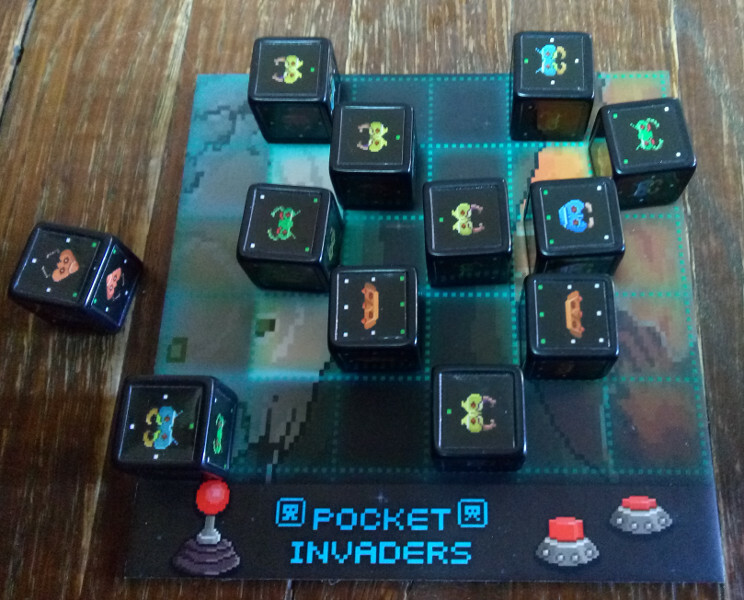 If you take an enemy piece, you roll the die to see which type of ship you can deploy later on your side. We were kinda tired when we got back home, but it was a lot of fun to wander the halls and to see what’s on offer. – If you’re staying towards the end of the day, it’s best to have research dinner options close to the Messe beforehand — it’s probably better than greasy truckstop food, even though the serving ladies were friendly and charming. Friday, after dropping the kitties off at their vacation adress (with the associated drama), we went to Antwerp. Of course, we’ve been there before, but we had a special reason to spend the weekend there. And it’s a fun city to walk around in, so why not? We booked a room in the B&B that we stayed in previously, and set off. I wanted to check out a dedicated game shop in Merksem, which is suburb of Antwerpen. When we arrived, we didn’t have money for the parking meter — but klik had forgotten to bring her coat (and it was cold! ), so we bought one at the C&A and solved two problems in one go. Then we found out that the shop wasn’t open until later that afternoon… We had lunch (best make use of that parking money anyway) and then went to the B&B. The room was not yet cleaned, but we could leave our luggage and take the key. We walked towards the city centre (after getting the car from the large, free lot and parking it in front of the B&B’s garage door — so that the owner could keep his parking spot without owning a car), had coffee/tea (and cake) at a coffee place that had been opened the week before (called “Abol”). Then we took a metro/tram to Merksem. The game shop was a bit weird: we had to rung the doorbell to get in. It seemed to be the ground floor of a private residence (and it reeked of tomcat sprayings…) The front room was packed with stuff, with an impressive collection! 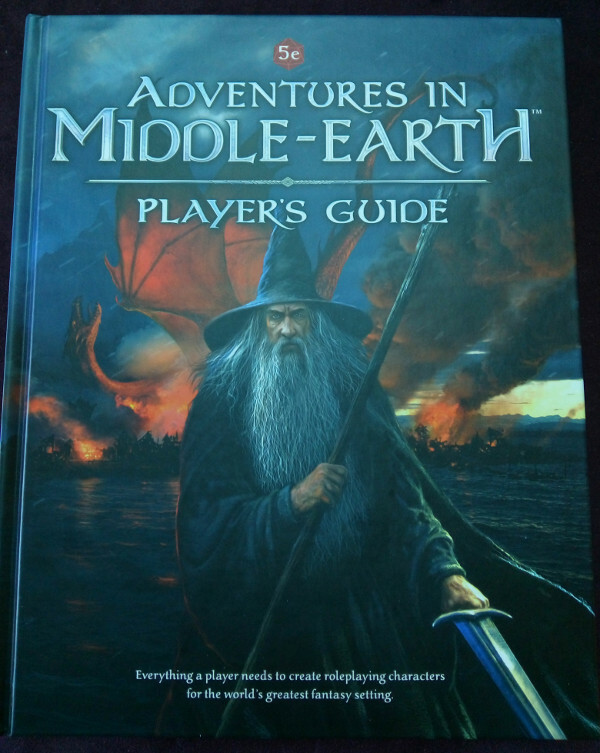 Lots of obscure and old stuff, so I don’t think their inventory moves a lot… I did manage to find a physical copy of ‘Tales from Wilderland’ for The One Ring which I bought. I have a PDF copy, but since I have the rest of the game line (also) in physical book form, I thought it would be cool to complete my collection. On Monday morning, we checked out from the B&B. Then we drove to the Sportpaleis (“Sports Palace”, an indoor sports and event arena) and managed to park our car right next to it for the measly sum of 5 euros. We took the metro to the train station and spent the day in the zoo. It’s not overly big, but we had a lot of fun, for instance by trying to spot all the camouflaged reptiles. Then we went back to the Sportpaleis and met up with babarage and friend I. (because her husband couldn’t come because he had to be sworn in as a provincial representative, or something stupid like that). We had a chaotic (and expensive!) dinner at a disorganised restaurant and then walked back to the stadium in order to attend the Sting & Paul Simon concert. We had arena tickets, and we were promised seats on both sides of a wide aisle, but it turned out that those row numbers were not next to each other! We were standing around talking about this, when we were approached by someone with a different badge from the one person who showed us our seats. He mumbled something about a price category, and asked us to follow him as he walked to the front. We ended up on row 7, right in the middle! Probably the best seats in the house. The concert was really cool. Especially Sting had a great time, and we had too! The past few years, the Rijksmuseum (‘State Museum’) in Amsterdam has been under heavy renovations. With only a skeleton collection, the museum was very generous with giving their pieces to other museums on display. But with the newly renovated museum in full operation again, it was time to call in the favours from those other museums and collections. The result is the exhibition of The Late Rembrandt. Of course, the Rijksmuseum is best known for its collection of works by Rembrandt (most notably the Nachtwacht), but they are not the only museum that has a collection of Rembrandts. The exhibition focusses on the last years of Rembrandt’s life, when he developed a more… let’s say “impressionist” style. And it features works that have not left their spot for decades, but that they somehow managed to get on loan. The list of participating museums and collections is quite impressive. So, all in all, a unique exhibition with works that will probably never be seen again together. It’s just that I’m not much of a fan of Rembrandt — my tastes range more into modern art. But my father wanted to see this exhibition, and I thought it was a good reason to spend some time together after all his medical troubles. He rarely leaves the house without my mother, and it would be good for him to spend some time on things that interest him. klik also came with us. We spent Sunday night at my parents’, and in the morning set off to Amsterdam. We parked near the museum (my father would pay the extortionist parking fees) and we set off. If you have even a passing interest in Dutch masters in general or Rembrandt in particular, then you should go see this exhibition. I’m glad we went, not only because we got to spend some quality time with dad. The rooms were quite busy though — even though everyone had tickets for entering during a 2-hour timeslot, and by the time we had seen everything, my dad was exhausted. We managed to get some lunch and then went back. We got up reasonably early (by holiday standards) and left for Den Haag, to visit the municipal museum there. Specifically, we wanted to see the unique exhibition on Rothko. His paintings made a big impression on us when we saw them at the Tate Modern, so we wanted to see and know more. Because of the holidays, they were even opened on this Monday — usually it’s closed on Mondays. Luckily, the ice had subsided and the roads were clear of ice and snow, so we made good time. Within the estimated 90 minutes, we were at the front of the museum. And there we saw the long, long line just to get in — from the entrance all the way to the curb! Look, I do want to see the exhibition. But I do not want to stand in line just to get in, and then crowd-surf to the stuff we want to see. That’s just not going to happen. And then we went back home. We’ll go see Rothko some other time. ingiechan wanted to get out of the house at least once this weekend. A week ago, she received the new folder of the museumjaarkaart (‘museum year card’, which allows you free entrance in many museums in the Netherlands) and there was mention of an ukiyo-e exhibition with work from Hokusai, in the Sieboldhuis. And so we set out to Leiden today. Siebold was a doctor who visited Japan as part of the Dutch trade mission. He was a true scientist who tried to gain as much insight on Japan as possible, so he collected many artifacts and plant- and animal specimen. Some of his collection is now on exhibit in the Sieboldhuis, his former residence. It’s an interesting collection indeed, but the main attraction today was the Hokusai exhibition. I love graphic work, especially after having done the graphics course — knowing the techniques used certainly adds to the appeal (to me). When we were in Japan last spring, we visited an ukiyo-e museum in Osaka. The Tokyo-Edo museum in Tokyo had many exhibits about ukiyo-e as well, and I got a good look at the technique and the detailing that was prevalent at the time. And so I loved the exhibition as well. There were some really interesting prints — some using blindprinting to add details, and from some prints there were two versions to show the difference between the original and a later reprint. And so we browsed through the ‘cheap’ bin and found one that we both really, really, really liked. So we bought it. It’s by Chikanobu, who was active as print-maker in the Meiji era (so, after Japan had become a modern nation). We bought this print, depicting a scene from a kabuki play, which in turn depicts a historical event. It’s part of a series of ukiyo-e prints. We don’t have the print at home yet — it has to be framed first, and we’ll be collecting it when we go back for the second part of the Hokusai exhibition. ingiechan snapped a pic of our print, though — you can see that it is nicely preserved: still full of color after 125 years. I’m very pleased that I will be owning a good quality ukiyo-e print. I can’t stop looking at it. F. had told us that his sister-in-law had to move from Zeeuws-Vlaanderen to the Noord-Oost Polder — and the new house was smaller than the old one. Among the things that were in the way were three boxes of Star Trek videos — around 90 tapes total. F. asked us whether we were interested. They were supposed to fetch EUR 100. We weren’t interested ourselves (we don’t even have a working VCR set up anymore), but M., ingiechan‘s sister, is a serious Star Trek adept and consumer of VHS tapes. Her budget is quite small, though, so we couldn’t offer more than EUR 50 for the lot. We had assumed that someone had been dilligently taping the episodes from TV, and even though 90 tapes is a lot, it’s not like VHS is a hot commodity these days. 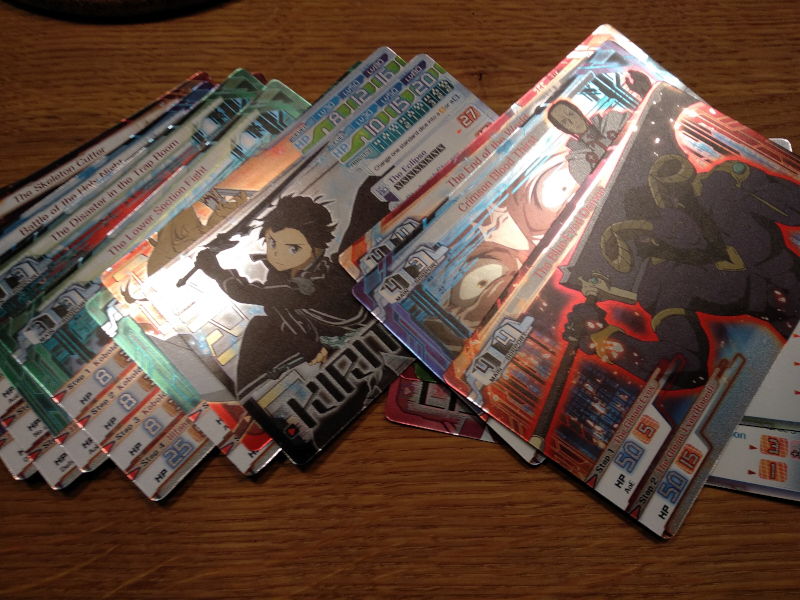 After a bit to-and-fro, it was decided that we could get the bunch for EUR 50, if we came to collect them. And so, this Saturday, we left around 11:00, so that we had a good chance to arrive there around 13:00 — and we had the ‘pleasure’ of experiencing the Belgian highways as well… So we arrived, and found F.’s nephew there. We got a cup of tea, chatted a bit, and then we went up the attic of the barn to see the tapes. It turns out that these weren’t home-tapes, but ‘official’ tapes. All of Deep Space Nine on VHS, all of Voyager, etcetera. Must have cost a small fortune to assemble the tape library, and now we were taking it off their hands for a few euros… Oh well, at least they didn’t have to lug the boxes across half the country. All in all, not a bad haul for a day out. Tomorrow, we’ll meet babarage and about 598 other geocachers at the Geocaching Multi Event, the first European mega (>500 people) geocaching event. We walked through the fairy-tale forest, ate sausage sandwiches (but declined the free ice hat because those are ugly), drank hot chocolate (but not from the half-liter mugs, which could go into the bags clean), were unable to enter the Diorama hall, waited half an hour for a ride, walked through the second half of the fairy-tale forest, ate fried rice, saw the park from high above, got disoriented in a tumbling house and had quite a nice dream. We spent eight hours in the park, about half of it after dark. Seeing everything lit up really adds to the atmosphere, but by 9PM we were really tired… We said our goodbyes, and went home. We went to bed really early, because we had to do a cache today — and that promised more walking!